When building a marketplace startup or the shared economy project aimed at enterprise level, there emerge dozens of decisions to make. One of which is: how to build a marketplace platform and what to choose? Outsource for the marketplace developers team or rely your project on online, SAAS-type marketplace app builders? Here we’ll consider 2 primary ways of how to create an online marketplace. Let’s measure the scope of pros and cons for both development methods. What type of online marketplace platform are you aiming at? The very first thing you need to do is to decide what kind of buy and sell platform you want. Is it supposed to be an online marketplace for sellers? A B2B, B2C, or P2P marketplace platform development? Are you wondering how to build a marketplace app, that is a cross-platform solution? What industry should it work for? Is it a unique product or are there competitors already? Who is it created for? What does my project have to offer? How will it solve my customer’s pains? What marketing + distribution techniques will work the best to create an online marketplace that would be on everyone's lips? How can I monetize the project? What are the possible ways to earn money on it? If you’re targeting to build a shared economy app or B2B/B2C marketplace app, you might find the detailed steps-to-go in the article on launching a scalable online marketplace platform . When are marketplace app builders the exact solution you need? Are you building an MVP of buy and sell platform or the solution of local type? The Arcadier’s story started in 2013. The project was launched by the people from PayPal. Arcadier’s primary aim is to target the marketplace app creation mostly in Asian countries. The current marketplace app builder tool was launched by Antti Virolainen and Juho Makkonen in 2011. The very concept of the solution is to let people build, manage, and maintain a P2P buy and sell platform created on their own. Ability of payment system to hold funds on behalf of the marketplace, till the time the ordered item is delivered to the customer. You can check the full list of features on Sharetribe’s ‘Features’ landing. 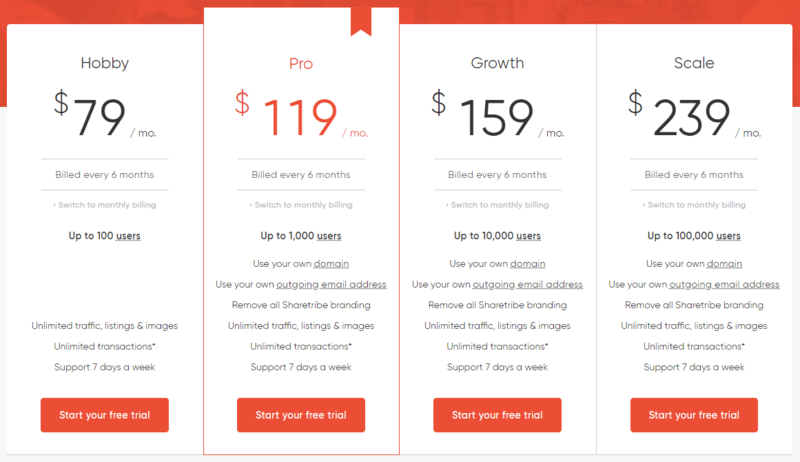 First, Sharetribe gives you a 30-day trial to check out the features of the chosen pricing plan. Then you can make your decision whether to start your own online marketplace using the current solution, or look for other marketplace app builders. The primary advantage of these DIY solutions is that you can set up a neat marketplace with no coding skills at all. You'll receive basic functionality out of the box. Such solutions usually include drag-n-drop, WYSIWYG features, and work the best for building small-to-medium marketplace projects/startups. How about the scale of customization ? - You want to start your own online marketplace in your country, where apart from PayPal or Stripe, people prefer other payment systems , like Klarna, Skrill, or iDeal (in the Netherlands) only. - Or let’s consider another example, where you want to implement different types of notifications (i.e. SMS alerts, email, and push notifications) for your online marketplace platform or sharing economy app at once. Online marketplace app builder is surely not enough. You need to understand that enterprise marketplaces require way more extended functionality than startups or MVPs. First of all due to the fact that they’re crafted for a large number of visitors/users, the appropriate front-end/back-end technologies should be applied, that also work well for cross-platforms multi-sided marketplace development. Business idea behind enterprise marketplace apps might foresee multiple integrations with 3rd party services (i.e. payment solutions, analytics, cloud solutions, maps, API integrations with other specific services). Marketplace app builders might provide either limited integrations options or don’t offer such opportunity at all. Large products should be constantly supported, maintained, and tested by a team of in-house or outsourced developers. Owners of medium-to-large solutions might be in the constant rush to implement new one-of-their-kind features. Thus, they need a relible tech team to get the work done correctly. If you've chosen custom development of sharing economy apps/platforms, you should know that the prices here depend on a lot of aspects: the range of features you plan to implement, design work, R&D, etc. Thus, the process might get costly enough, sometimes. No worries, though. Read our article on how you can save resources by hiring React Native developers team. Not all marketplace app builders of SAAS type allow product’s owners possess their marketplace project’s code. At Apiko, we’ve helped to carry out a P2P event marketplace platform, called Meals Unite . This is mostly the Netherlands-based project. We’ve dealt with frontend, backend, and Android mobile app development. The aim of this online marketplace platform is to connect people through the food ritual in a warm homelike atmosphere. The app allows you to arrange some kind of ‘meal parties’ right at your home and invite your friends or complete strangers to have nice conversation and time. What solution should I choose in the end? In case you’re wondering how to build a marketplace platform, not a heavily customized one, which you’d like to support and handle on your own, go ahead and try SAAS-builders. If you’re about to create an online marketplace solution of enterprise level (B2B or B2C solution especially), DIY platforms might be not enough, since as we’ve stated above, the bigger the product is, the more complex organization and more resources it requires. But, at the same time, large B2B, B2C online marketplace platforms should be intuitive in use for the end users.